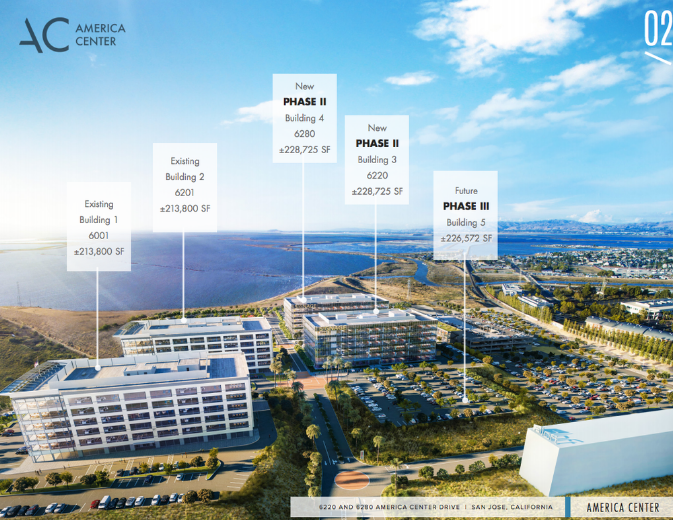 The final phase of the America Center in San Jose's northernmost tip is breaking ground. Two more six-story buildings will add 450,000 SQFT of office space to the office center, bringing the grand total to 1.1 million SQFT. Polycom and Flextronics both have their US headquarters in the office complex. There is also a new Aloft hotel onsite using the "Aloft Santa Clara" moniker (the naming really irks me since it is physically located in San Jose). The new building will be wrapped in a massive amount of electrochromatic glass, which can tint the windows automatically based on the amount of sunlight or user preference. This helps cut down on HVAC costs and is also more convenient for people working in the building. Other cool amenities include a 16,000 SQFT fitness center/cafe, a roofdeck with putting green, an outdoor bar, and 36 electric vehicle charging stations. The location is right off of Highway 237 and close to Highways 101 and 880, making it easily accessible by freeway from all directions. Transit access is nonexistent although there might be some corporate shuttles available to employees. For more information, visit the source link or watch the video below. America Center | ±1,100,000 SF Class "A" Office Opportunity for Lease from Newmark Cornish & Carey on Vimeo.